This blog has nothing to do with photography. It has much to do with life. As we travel our individual path, we are sometimes- rarely- fortunate enough to meet up with a person whose very presence can change you in deep and meaningful ways. 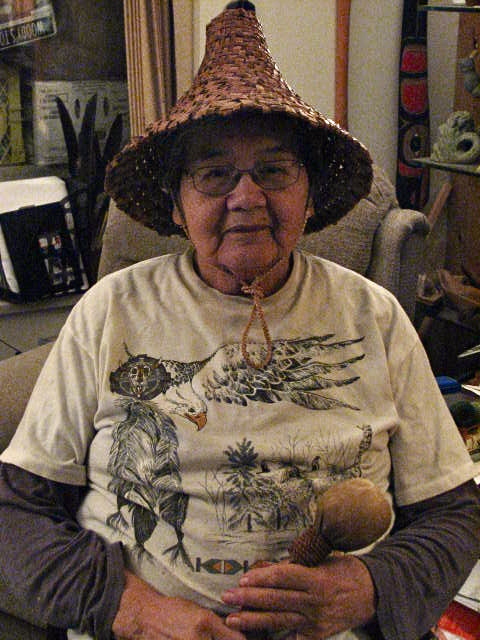 Such a person in my life is Barbara Higgins, known as Xwu’p’a’lich to her fellow tribal members. Barb is an elder and a revered traditional healer and medicine woman for her Coast Salish First Nation’s tribe on Canada’s Sunshine Coast. I could sing her praises for this entire blog, but that’s not my purpose. Suffice it to say that she is wise beyond her years and, my guess is, she has been that way for her entire life. I have been fortunate to sit in her living room, travel with her, canoe with her, sing and drum with her. I have attended the all-day coming of age ceremony for her grandson, Robert. I have witnessed her, her daughter Holly, and Robert singing and drumming on a Sunshine Coast beach as their spirits connected with a gray whale and slowly brought it ever closer to us. My wife, our granddaughter and I stood in watching in amazement, until it was but 50 yards offshore, its vaporous breath resonating in our ears. But, most all, what I love about Barb is her story-telling. People sit around the proverbial (and sometimes virtual) fire pit, spellbound, as she weaves her tales, usually from childhood recollections. That is why I was excited to get a note from Barb, telling me that one of her stories had been accepted for David Suzuki’s website. If you have 15 minutes I suggest you get yourself a cup of coffee, sit back and enjoy the world that Barb creates with her story. And perhaps I was wrong about this having nothing to do with photography. In the end we are both storytellers. Only Barb’s stories you can almost hear, feel, taste and touch. Let her transport you to a different time and a different world, to a time in her youth when she battled a giant octopus near Skookumchuk Rapids on the coast of British Columbia in 1943. When you’re done, please let me know what you think by commenting below.